A Birmingham City University graduate is celebrating after her work has been shortlisted for the prestigious Ruskin Prize. Now in its fourth year, The John Ruskin Prize aims to uphold English art critic Ruskin’s belief that drawing helps others to see the world more clearly and take heed of its fragility. 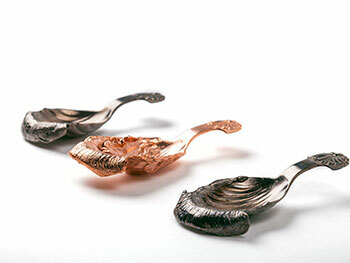 Nuala Clooney, who studied Jewellery, Silversmithing and Related Products at Birmingham City University’s School of Jewellery, impressed competition judges with her spoon designs which explore multi-sensory perception and bodily experience. “I create objects using casts from my own body which play with notions of intimacy and examine the connections between internal spaces and the outside”, said Nuala who lives in Exmouth, Devon. My designed ’Lip-Spoons’ objects have been fashioned by own mouth for them to be returned to the mouth – the mouth of the audience. Nuala is one of 26 artists to be shortlisted out of over 1,000 entries that responded to this year’s prize theme of ‘Artist as Polymath’. The John Ruskin Prize was inaugurated in 2012 by The Guild St. George and The Big Draw. Winners will be announced on Tuesday 20 June at a prize-giving ceremony at the Millennium Gallery in Sheffield, where a top prize of £3000 is up for grabs. Shortlisted entries will be showcased at the Millennium Gallery from 21 June to 8 October 2017.